A solvent is a liquid that dissolves a solid, liquid or gaseous compound called solute, giving rise to a solution. The solvation (or dissolution) in chemistry is interaction between solute and solvent that brings the single dissolved solute molecules to surround themselves with solvent molecules. If the solvent responsible for solvation is water, the solvation process is called more specifically hydration. Solvent molecules surround the solute in order to direct the charge of one towards the opposite charge of the other and to stabilize the system. The interactions that can be established between solute and solvent are hydrogen bonding, ion-dipole or dipole-dipole interactions, or Van der Waals forces. The number of solvent molecules that surround an ion (solute) and interact with it in the phenomenon of solvation is called the solvation number. A solvent is a liquid that dissolves a solid, liquid or gaseous compound called solute, giving rise to a solution. The solute is the component of the solution whose state of aggregation is different from that of the solution itself. The solvation (or dissolution) in chemistry is interaction between solute and solvent that brings the dissolved solute to be surrounded with solvent molecules. A solution differs from a generic dispersion because the solute is dispersed in the solvent at the level of the single molecules or ions and therefore there are no two phases. Water is the most common polar solvent. Polar solvents are those whose atoms carry partial charges, i.e. a dipole. Water molecules (H2O) are made up of two hydrogen atoms and one oxygen atom: hydrogen atoms tend to reject electrons (being more "electropositive" than oxygen), while the oxygen atom tends to attract electrons (being more "electronegative"). Then the water molecule has a positive charge (δ +) at the hydrogen atoms and a negative charge (δ-) at the oxygen atom (in other words it is a "polar" molecule). Other polar solvents are DMSO, acetonitrile or alcohols. By dissolving a salt or a polar molecule in polar solvents, solvent molecules surround the solute in order to direct the charge of one towards the opposite charge of the other and to stabilize the system. The interactions that can be established between solute and solvent are hydrogen bonding, ion-dipole or dipole-dipole interactions, or Van der Waals forces. As a solute, consider cooking salt (sodium chloride) dissolved in water (which acts as a solvent). Sodium chloride (NaCl), in the solid state, is instead formed by sodium ions (Na+) and chlorine ions (Cl-), in a 1: 1 ratio and arranged in a particular crystalline structure having cubic geometry. 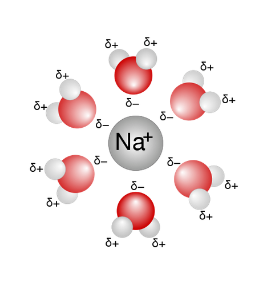 The sodium and chlorine atoms interact through ionic bonds, whereby sodium chloride is an ionic solid, and as such it undergoes electrolytic dissociation if it is immersed in water (which is a solvent with high dielectric constant), generating Na + ions and Cl- ions. A Na + ion dissolved by water molecules. The oxygens of the water molecules, bearing partial negative charges, are oriented towards the opposite charge ion. These ions, being charged, interact with the molecular dipoles constituted by water molecules. In particular, the water molecules are arranged around the ions so as to present their part with an opposite charge to the ion in question. Thus around the Na + ion the water molecules are arranged around the oxygen atoms facing the central ion, while around the ion Cl- molecules of water are arranged around the hydrogen atoms facing the central ion. Thus the phenomenon of solvation occurs. Only a part of solvent molecules (in this case water) interact with the ions. These molecules constitute what is called the "hydration sphere"; the rest of the solvent molecules instead constitutes the "bulk" of the fluid. The number of solvent molecules that surround an ion (solute) and interact with it in the phenomenon of solvation is called the solvation number. The number of primary solvation is also defined as the number of solvent molecules which remain integral with the central ion during the motion of the central ion within the solution. These molecules correspond to the so-called "primary solvation sphere". Most of the chemical elements are metallic, and in the oxidation state +1, +2 or +3 in water form simple aquoions of formula [M (H2O)n]z+. 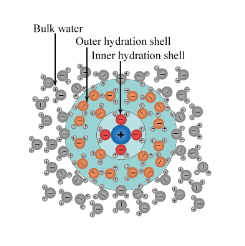 In aqueous solution the water molecules directly linked to the metal ion form part of the first coordination sphere, also known as the first sphere of solvation or first sphere of hydration. The link between these water molecules and the metal ion is called the coordination bond: oxygen provides a pair of electrons to form the bond. Each molecule of coordinated water can be connected via hydrogen bonding to other external water molecules, which form the second coordination sphere, also called the second sphere of solvation. For charge cations 1+ or 2+ the second sphere of solvation is not such a well-defined entity. In diluted solution the second sphere of solvation fades towards the body of the solution, where the arrangement of the water molecules is given by an irregular network of hydrogen bonds between the various molecules. Charge 3+ ions have a high enough charge to bias the water molecules in the first solvation sphere, so that the hydrogen bonds with the molecules of the second solvation sphere are strong enough to form a more stable entity. The strength of the metal-oxygen bond (M-O) can be estimated in various ways. The most reliable measure is obtained from the enthalpy of hydration, even if its determination is indirectly based on experimental measurements. The scale of values is based on an arbitrarily chosen zero, but this does not affect the differences between the values of two metals. Other measurements are based on the M-O vibration frequency and the M-O bond length. The strength of the M-O bond tends to increase with the charge and to decrease as the metal ion size increases.